Amanda, or “Ama” Scriver is the Sunday moderator for the #FatGirlFlow Fam community account, where we celebrate fat and plus-size bodies daily. I sat down with Ama to learn more about her (okay, she lives in Canada, so we did this over the internet!) and spotlight her work! Tell us about yourself! What area of the world do you live in? What do you do for work/for fun? I am a freelance journalist and I cover the three f’s: Food, Fat and Feminism. I live in Toronto, Ontario, Canada. I am addicted to reality television (current fave is Real Housewives) and chips. My favourite fashion accessory is a good manicure, a pair of glasses and a very bright lip. I love escape rooms, traveling, drag shows and comedy. Omg, escape rooms freak me out. But I love that you love them! What are 1-2 things you like about yourself? My chubby cheeks and my ever-changing hair. 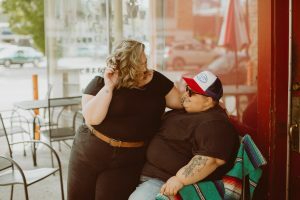 Why is growing a fat and plus-size community important to you? Fat community is important to me because it helps me understand that large, squishy, chubby bodies are okay just the way they are. That no matter your size, we can love our bodies just the way they are. That there are other people like me out there, experiencing and living through the same things and together we can sharing our lived experiences online via social media. It’s important to have this and share with one another and feel connected. It helps me feel whole, and it helps me feel like I’m not alone. Omg, love that pic. What do you do when you’re not living your best life on the Gay Beach of Chicago?! I’m a busy person, so there are a few things (laughs). 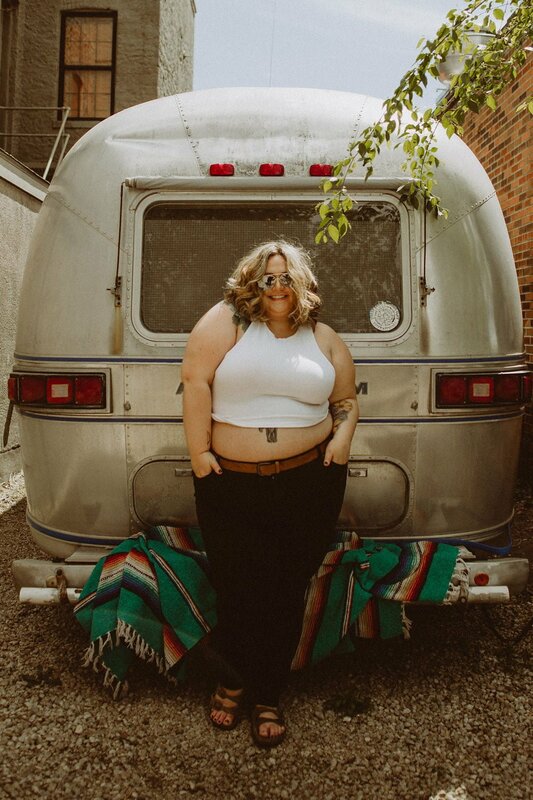 My life revolves around my freelance writing, and I’d love to connect with more of the #FatGirlFlowFam community over longform pieces. You can find my writing on my Facebook or Twitter. Also, if you’re a company or outlet in need of some political body positivity, hire me! You create great work. Can you share two of your favorite pieces that are a must-read? Be sure to join checkout Ama on Instagram, and say hi to her on Sundays when she’s moderating the FatGirlFlowFam Instagram!